New Zealand’s adventure capital offers countless opportunities to experience the great outdoors. Widely considered to be Queenstown’s premier ski mountain, The Remarkables are an impressive range best viewed by helicopter. We picked a fantastic location to experience our first heli-tour adventure. It is an eerie feeling lifting off the ground, and even more bizarre actually landing on top of a snow-capped mountain, only a few feet away from rocky cliffs drops that plummet a thousand meters. There are so many things to do in Queenstown, and New Zealand for that matter. If bungy jumping, skydiving, snowboarding or high-speed jet boating through canyons is not your thing, we recommend viewing the magnificent landscapes by helicopter – you’ll be glad you did! Have you experienced New Zealand? What is your favourite outdoor adventure? WOW! That is cool shot. Never been in a helicopter before. I hear NZ is a lot like Canada? Cool photo! I assume that this will happen for a trip! 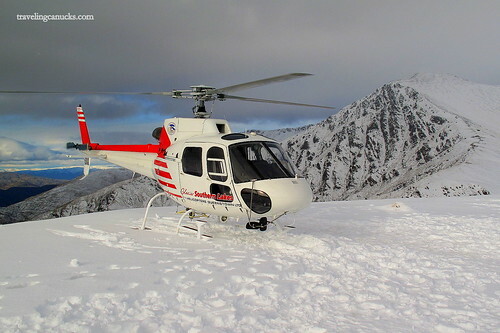 What’s the feeling of riding a helicopter in winter when it landed?